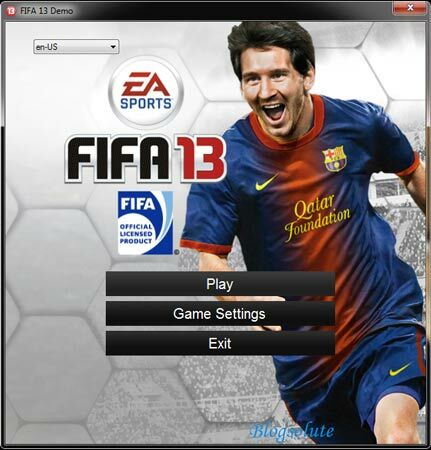 Finally FIFA 13 Demo has been released and FIFA enthusiasts can download it for free. The demo game will provide you with good speculation of what the full game has to offer. Specially you will notice the differences between FIFA 13 and all the prior versions you have played so far. Before going into much details lets have a look at the official FIFA 13 Demo trailer. While Playing the demo you will notice that it is easier to control players and perform complex combos. The main difference between FIFA 13 and the previous versions is the realistic approach. Things will not be the same as you expect it to be. The ball has its own behavior, it will bounce and will have slight natural turn as we have in real life game. Players not controlled by user are more aggressive towards receiving passes and holding positions. The commentary system seems bit of the same which disappointed me, boring and repetitive. You will find the menu simple and interactive to quickly jump in action. Now lets see how you can download FIFA 13 Demo quickly for free. You do not have any standalone setup file to download and play the game. So what you will need is the official EA Store Client i.e Origin. So you will be required to create an Origin account if you are not already having it. Once the account is created you have to download the Origin Client. Login to the origin Client, you can also signup for account from here. Go to Store->Free Games, you will find FIFA 13. Click on it. Click on the download button to start the download. You can also mark it as favorite and download later. The Download size is almost 2.20 GB, so you can expect it to take a while. Once the download is complete you can play FIFA 13 directly from Origin. To uninstall the game open Origin->My Games. Select the more details option. You will find details about your game and will also see the uninstall option to remove FIFA 13 from System.